When completed next spring, Lumen at Tysons will have 398 apartments and 11,000 square feet of retail space. It is located at the intersection of Leesburg Pike and Chain Bridge Road and next to Metro's Greensboro Station. 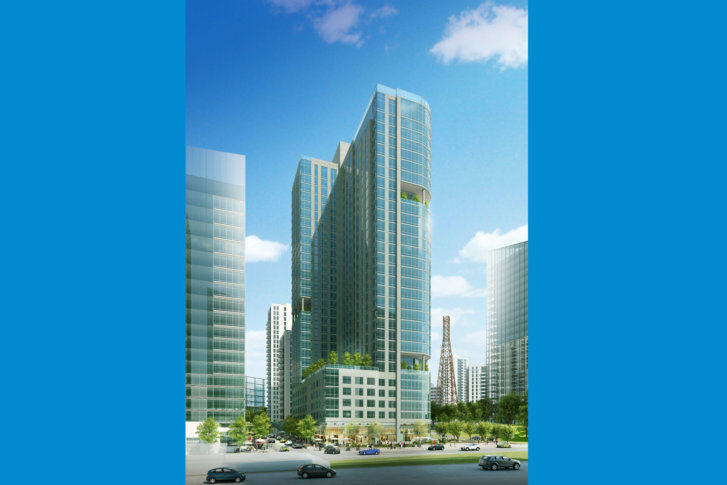 WASHINGTON — Lumen at Tysons, a 32-story luxury apartment building that is one of several new buildings planned for a development called Tysons Central, marked a construction milestone July 17. When completed next spring, Lumen at Tysons will have 398 apartments and 11,000 square feet of retail space. It is located at the intersection of Leesburg Pike and Chain Bridge Road and next to Metro’s Greensboro Station. Residents in the upper floors will have quite a view. “With such a prominent location in Tysons, the residents will have views that stretch from the Blue Ridge Mountains to the Washington Monument and National Cathedral. Lumen at Tysons is a landmark project in Tysons,” said Jeff Kruse, vice president of Hoar’s Washington D.C. division. The building will have a large public plaza.